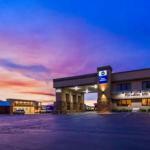 Well-appointed rooms free Wi-Fi a sky-lit indoor pool and free breakfast add up to value at Best Western Paradise Inn. This 53-room hotel on two floors offers free Wi-Fi free local calling and cable TVs in every room along with coffeemakers microwaves and refrigerators. The inn provides a free full breakfast buffet with hot and cold choices and the on-site restaurant is open for three meals a day. Business services are available for the road warrior and after a day playing or working the indoor heated pool and hot tub with skylights offer welcome relaxation. Parking is free and pets are allowed for an extra fee. The Best Western Paradise Inn is off I-15 an hour from Cedar Breaks National Monument 90 minutes from Bryce Canyon National Park and two hours from Zion National Park. The nearby mountains provide endless hiking fishing snowmobiling and ATV riding. Cedar City Regional Airport is 56 miles away and Las Vegas International Airport is 234 miles.